For a long time potential theory was necessarily viewed as only another chapter of mathematical physics. Developing in close connection with the theory of boundary-value problems for the Laplace operator, it led to the creation of the mathematical apparatus of potentials of single and double layers; this was adequate for treating problems involving smooth boundaries. 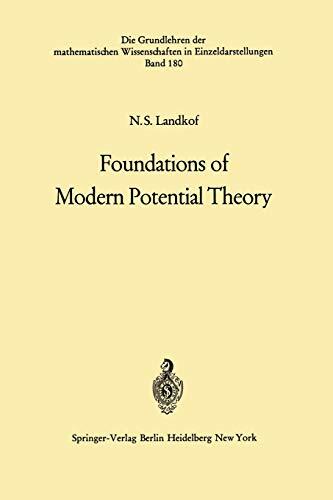 A. M. Lyapunov is to be credited with the rigorous analysis of the properties of potentials and the possibilities for applying them to the 1 solution of boundary-value problems. The results he obtained at the end of the 19th century later received a more detailed and sharpened exposition in the book by N. M. Gunter, published in Paris in 1934 and 2 in New York 1967 with additions and revisions. Of fundamental significance to potential theory also was the work of H. Poincare, especially his method of sweeping out mass (balayage). At the beginning of the 20th century the work of S. Zaremba and especially of H. Lebesgue attracted the attention of mathematicians to the unsolvable cases of the classical Dirichlet problem. Through the efforts of O. Kellogg, G. Bouligand, and primarily N. Wiener, by the middle of the 20th century the problem of characterizing the so-called irregular points of the boundary of a region (i. e. the points at which the continuity of the solution of the Dirichlet problem may be violated) was completely solved and a procedure to obtain a generalized solution to the Dirichlet problem was described.